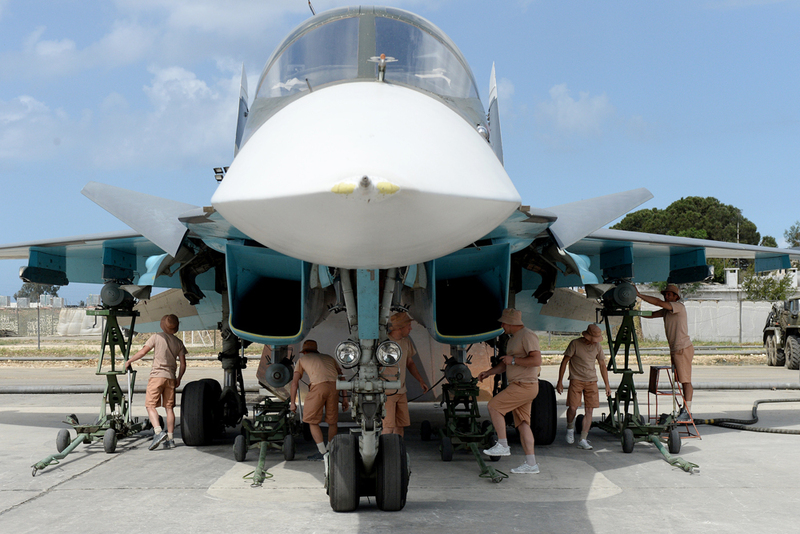 Russian servicemen prepare an SU-34 fighter jet for a mission from the Russian Hmeimim military base in Latakia province, in the northwest of Syria on May 4, 2016. A reporter with RIR arrived at Russia's Hmeymim military base in Syria and found how a war was being waged against militants from the Islamic State and Jabhat al-Nusra, after the bulk of Russian forces have been withdrawn. Russia's Hmeymim military base in Syria pulsates with activity day and night. Despite the truce announced on February 27, the war against Islamic State and Jabhat al-Nusra is continuing. Our plane arrived at the military base at eight in the morning. The unit's personnel were already in full kit in the parade ground at that hour, ready to be deployed on combat duties. A briefing was held immediately for journalists, while servicemen were preparing fighters and bombers for take-off: they were loading two 500-kilogramme high-explosive bombs into a Su-34S fighter-bomber. Maj. General Igor Konashenkov, a spokesman for the Russian Defence Ministry, told RIR that several Russian aviation units were being sent to a region which included the cities of Raqqa and Arak, as well as to the city of Deir ez-Zor, which is besieged by terrorists. "Heavy fighting is underway on the outskirts of the latter, and residents of the city were completely cut off from the rest of the world," he said. "Every 10 days, military transport planes drop humanitarian aid for the population in Deir ez-Zor. The situation in the city is serious." Russian and Syrian troops also deliver humanitarian aid to residents of the besieged city of Aleppo. Government forces were able to free one of the land routes from the terrorists and now it can be used to deliver essentials to residents of the city. "Last week, the terrorists tried to disrupt our supplies and attacked the convoy, but we were able to repel the attack and keep the route under control," Konashenkov said. He also said Russian aircraft do not carry out strikes in the area around Aleppo. From Hmeymim airbase we arrived, along with the Russian military and units of Syria's armed forces, in the village of Kawkab (which means "planet" in Arabic - Ed., near the city of Hama), 10 km from the front line. The previous day, the bulk of Jabhat al-Nusra terrorists had been dislodged from the settlement. The remaining small groups decided to surrender and swear allegiance to the current Syrian government. Houses and walls were peppered with assault-rifle and machine-gun rounds, and some walls had gaping holes caused by 122-mm guns. Despite all the horrors of the war, the absence of water and electricity, joy reigned in the village. Residents were returning home after the liberation of the village from the terrorists. The village elders signed a loyalty pledge to the legitimate government before our eyes, while the Jabhat al-Nusra terrorists, guarded by Syrian soldiers, laid down their arms. One of the Syrian officers told RIR that the militants who had not committed serious crimes would be able to return to normal life. They would be able to begin to cultivate land, rebuild their homes and be reunited with their families. When Jabhat al-Nusra terrorists came to the village, he said, the majority of the villager inhabitants had no choice but to either lose their lives or to join the ranks of the militants. This situation is widespread in the country, divided by the civil war, so the government decided to allow a part of the former militants to begin a new life. RIR thanks the press service of the Defence Ministry of Russia for help in the organization. Since February 27, a total of 62 militant groups with a total of more than 7,000 people have joined or agreed to be part of the ceasefire. These figures are the result of painstaking work done by the officers of the Russian reconciliation centre in Syria, who were able to bring village elders from 90 settlements within Syria to the negotiating table over the past month and a half.